The story behind the quote: The quote comes from Nintendo’s franchise, Pokemon. This game was one of the biggest reasons why the Game Boy was a smash hit. In the game, you play the role of a Pokemon trainer who tries to travel the world and capture all of the possible Pocket Monsters out there. However, you will have to defeat them by pitting your own monsters against them as well as defeat other trainers who have the same goal. There is a strategy, however, regarding which Pokemon to unleash. Depending on what element the creature is, you can dish out more damage by selecting the proper creature that has the opposing element. 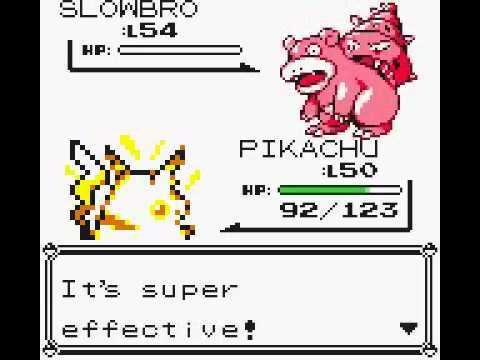 For example, Pikachu, who is the electricity element, will be able to do more damage to a Slowbro, which is a Water type Pokemon. When you do pick the right Pokemon and it does an attack, you’ll get the quote. Geek wisdom: It’s always best to use the right tools for the right job. You can try to use a substitute tool and it could work. But it may the job much harder. Try to work smarter, not harder. The story behind the quote: The quote comes from, of all things, the 2007 Nintendo E3 Press Conference. During the reveal of the Balance Board for the Wii Fit, Reggie Fils-Aime was called out on stage to demonstrate how the accessory works alongside Shigeru Miyamoto. As Reggie stepped on the Balance Board, he awkwardly delivered the quote. The quote has since become an Internet meme of sorts. Geek wisdom: In this day of age, it’s extremely easy to have a sedentary lifestyle. From the prevalence of fastfood and easy to prepare snacks to the ability to order things online and have machines do the heavy lifting for us, a lot of us have fallen into the trap of laziness. However, when we least expect it, we may need to actually do some manual labor. But we may not be able to because we have become of this unhealthy lifestyle. Take some time to exercise once in a while. The story behind the quote: This quote comes from the movie long Nintendo commercial, The Wizard. The story of the film is a “special” kid named Jimmy who wants to travel to California to put pictures of his dead sister in a dinosaur. His half-brother (played by Wonder Years’ star Fred Savage) breaks him out of the institution where he stays to help him get to California. Along the way, they meet a girl named Haley and they find out that Jimmy is a “wizard” in playing video games (get it?) so they enter Jimmy in Video Armageddon, a video game tournament with a prize of $50,000 going to the winner. The quote comes from one of the “villains” of the film, Lucas Barton. Lucas encounters the trio and exclaims that he is the best NES player ever since he has all of the Nintendo games ever made. To emphasize this even further, he produces the Power Glove and uses it to play Rad Racer. After completing the race in the game, Lucas turns to the audience, delivering the quote and plugging the Power Glove to the young kids who are watching the film. Geek wisdom: While it may seem like arrogance, it’s actually a good thing to take pride in what you have. Whether it be material things or your personal accomplishments, you have to be proud of it. There’s actually nothing wrong with what Lucas did in scene shown above. He’s just stating that he loves the Power Glove… and he proved why it’s awesome. The story behind the quote: Castlevania II: Simon’s Quest is pretty much known as the black sheep of the series. While the first game focused on platform jumping and a brutal difficulty level, Simon’s Quest took a totally different direction. It was now an RPG, where you need to talk to people and collect items. Because it was such a departure from the original, it wasn’t embraced by fans. It does have some unique tricks, such as using items to overcome obstacles and the day and night transitions (where the enemies become tougher at night). Anyway, the quote will pop up during the transition to morning from night. A box will appear to the left of the screen, signalling the end of the night, which can be a relief to players when they are just starting out with a low level. Geek wisdom: Time does heal all wounds. We can be deeply hurt by the actions of other people, especially those close to us. At the start, we can feel that we will never be able to forgive them. Heck, we can even not talk to them for years and years. However, as time goes by, the intensity of the pain that was inflicted magically starts to fade. We then remember the good times we had with that person and the hurtful action that was done becomes a distant memory. Once this happens, forgiveness become easy. The story behind the quote: The quote comes from a classic video game on the NES simply entitled Pro Wrestling. While very limited in the number of moves, Pro Wrestling was actually unique in the sense that each of the different wrestlers had their own specialty moves that only they could use. For example, Fighter Hayabusa had a move called the Back Brain Kick that was unique to him while The Amazon had the Piranha Bite and the Outlaw Choke. Anyway, the quote will pop up after you (obviously) beat any of your opponents on your road to fight the champion, The Great Puma. It became very popular very early on because of it’s hilariously incorrect grammar. It’s also known to be one of the first known instances of Engrish (named for the fact that Japanese usually substitute the letter R when trying to say the letter L). Geek wisdom: While it is inadvertently funny, you can still extract some wisdom from it. Basically, you do have to celebrate each of your victories. Even the small ones. While its great to be focused on the task at hand (becoming the champion in the game), make sure that you also be proud of all of the small good things in life that you encounter along the way.